The Lucie Awards is an annual event honoring the greatest achievements in photography. The photography community from around the globe pays tribute to the most outstanding people in the field. Each year, the Lucie Advisory Board nominates deserving individuals across a variety of categories. For over 70 years, Art Shay has documented life, combining his gifts of storytelling, humor and empathy. 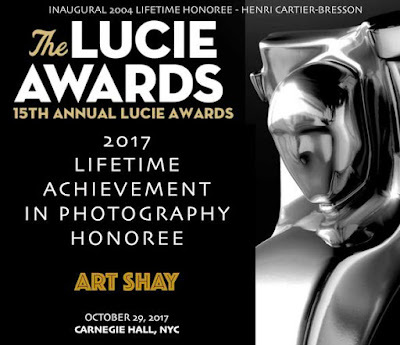 Art Shay, now 95, will be honored with the Lucie statue for Lifetime Achievement during the Lucie Awards gala ceremony at Carnegie Hall in New York October 29, 2017. “Art Shay: A Tribute” is currently on exhibit at Monroe Gallery of Photography, Santa Fe, NM, through November 19. At the same time, renowned photographer Steve Schapiro will receive the Lucie Award for Achievement in Photojournalism. Earlier this year the Gallery presented the exhibition "EYEWITNESS" to celebrate the completion of a project based on James Baldwin’s 1963 book, “The Fire Next Time”. Steve Schapiro’s photographs documenting the civil rights movement from 1963 – 1968 are paired with essays from “The Fire Next Time” by James Baldwin in a major book published by Taschen in March. Monroe Gallery of Photography was founded by Sidney S. Monroe and Michelle A. Monroe. Building on more than five decades of collective experience, the gallery specializes in classic black & white photography with an emphasis on humanist and photojournalist imagery. Monroe Gallery was the recipient of the 2010 Alfred Eisenstaedt Award for Excellence in Photojournalism.